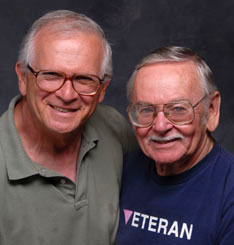 Bova ( left ) and Darby have been together since 1963. They are activists working to overturn the military's gay ban, and support numerous gay causes. Bova was born in Erie, PA, on June 1, 1938. He attended public schools in Erie and then went to Georgetown University in Washington, DC, from 1956 to 1960. He arrived in Chicago in the fall of 1960 to attend the University of Chicago Graduate School in Education and Library Science. He worked at the National Opinion Research Center ( NORC ) from 1963 until retirement in 1998. Volunteers as a tour guide at the Frank Lloyd Wright Robie House in Hyde Park. He met and married James Darby on July 17, 1963. He and Darby are very active in local and national gay veterans efforts, including American Veterans for Equal Rights. They are also advocates of overturning the military's gay ban. Darby was born in Chicago on Feb. 26, 1932. He attended parochial and public schools. After graduating from Englewood High School, h was drafted into the military and wound up in the Navy. He served four years in the U.S. Navy as a Communications Technician Second Class, much of the time on the U.S.S. Midway, an aircraft carrier. He used the G.I Bill to go to several colleges, and finally graduated from Roosevelt University in 1963. Darby went on to get a Master’s Degree at Illinois Institute of Technology. He was a high school teacher in the public schools from 1963 to 1992, teaching English, Spanish, French, Typing, Art and Mathematics. Darby founded the Chicago Chapter of GLBVA ( now AVER ) in 1991. He served on the National Board as Newsletter Editor, Secretary, Vice-President and President.